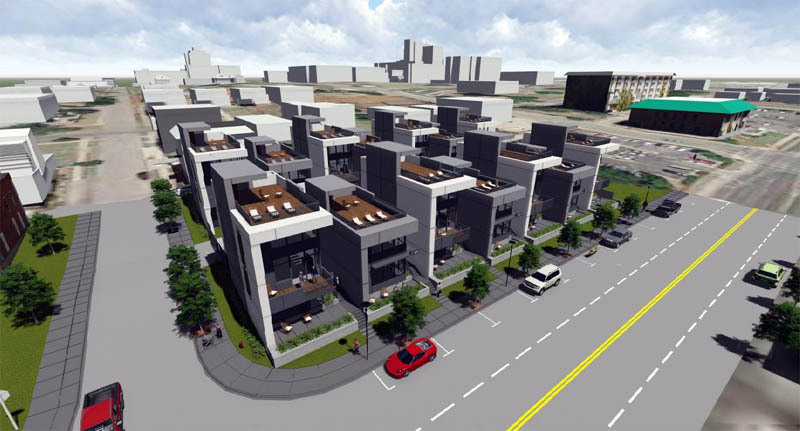 Northline Development has revealed plans for 14 luxury for-sale units to be built on a vacant lot at the northeast corner of NW 6th and Francis in the South of Saint Anthony (SoSA) area of Midtown. 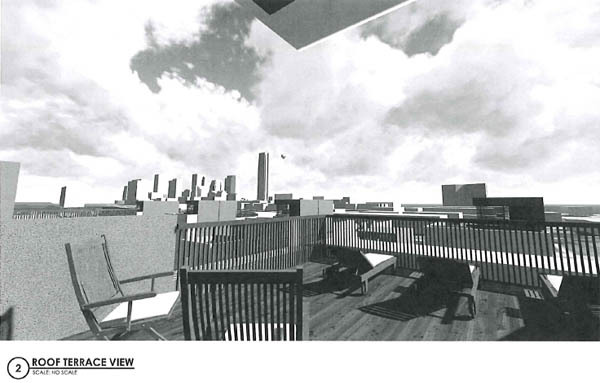 Plans call for two rows of 2- and 3-story stand-alone units, all with rooftop terraces and attached garages. The project is yet another is the booming SoSA area, with dozens of largely contemporary residences proposed, under construction or recently completed. The area still has some of the original small bungalows, but the majority have demolished to make way for larger, multi-story homes that generally offer commanding views of the downtown skyline. The architect for the project is ADG of Oklahoma City. The area has become a showcase for modern architecture. See our SoSA Summary for a complete index of nearly 40 projects in the area. Looks very cool....I like their house on 8th (think that is their project as well). I absolutely love this. Very similar to Lisbon Lofts and 915 NW 8th. Question. Will this development block the awesome views of downtown from the personal homes built directly north the past few years? One key difference between these and Lisbon is they are completely free-standing and detached. No shared walls. This kind of reminds of an area in Austin that is being gentrified. 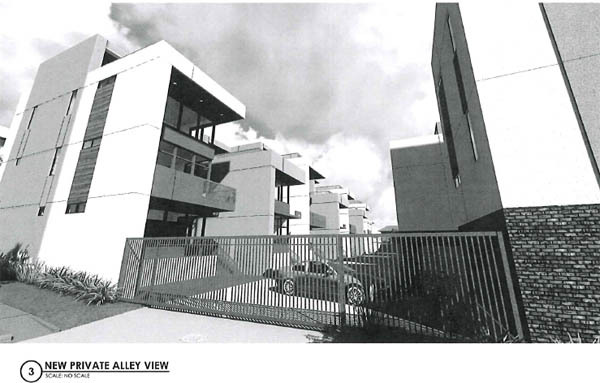 The first townhomes that went in to the area all had great views of downtown Austin, but when newer homes came in they were built taller with a lot blocking their neighbors. I know that comes with the territory, but hopefully that can be somewhat avoided here. Not only is there better privacy without shared walls, it allows for windows on the east side of each home. And on the west side of most of them, there will no be windows, so people will get the direct light from the east and not be staring in the windows of their neighbor. Pretty cool but also much more expensive to build this way. These are not going to be cheap. Is there a pre-sale contact yet? I know someone that would probably get on that list immediately if possible. Looks similar to the Urban 8 townhomes under construction in downtown Tulsa. Also detached but very close to each other. Who is the architect for that development? For this project, it's ADG. Exciting, but alas, another for-sale development probably out of my price range. Don't despair completely! By offering rich folks a desirable place to live this development will, in its own small way, keep other, existing urban neighborhoods more affordable. To paraphrase Matt Yglesias: it's either the rich people get to build homes in the most desirable part of town, or they all just buy a place in Classen-Ten-Penn (or Lincoln Terrace or the Paseo or Gatewood or, eventually Capital Hill), gut it and put in granite countertops and a master suite. I would really love to know more about the listings if/when they're available. Unit cost, square footage, layout, etc. 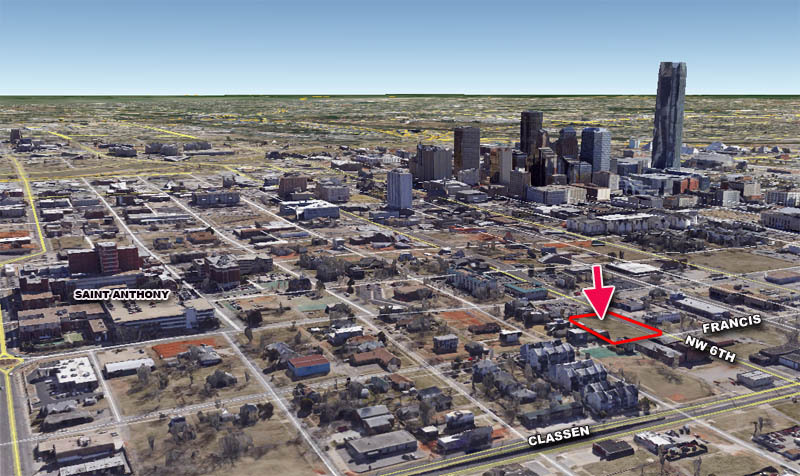 One of the pioneers of modern SOSA housing, Brian Fitzsimmons, will likely have his downtown view eliminated. But I guess thats life in a growing downtown. 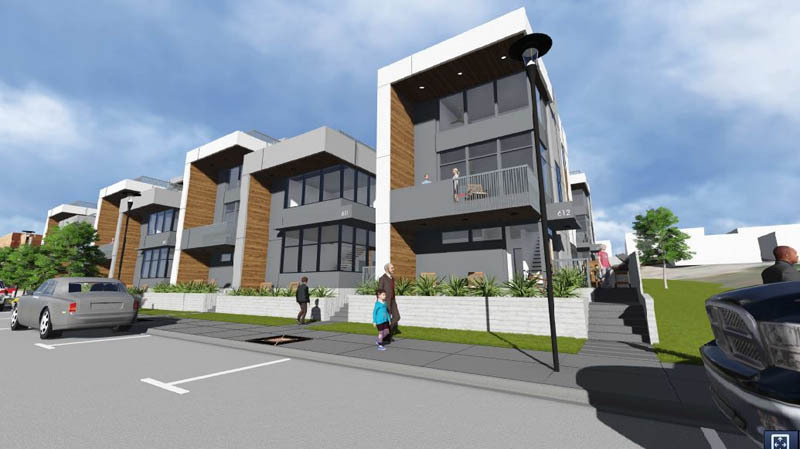 Doesnt Northline have for sale, or did recently sell, one of their duplex units on 8th for north of $275/ft? And those looked to be pretty basic units and construction. That tells me they will be asking quite a bit for these 14 units. I feel like they might struggle to sell these if they are price near $300/ft. YEs pretty sure that sold or was under contract. Think it was about $250 ft (450K / 1800 ft). I love these in Tulsa, but wish they had ground level retail spaces considering they went into a dense area with incredible potential. Still two great developments. Steve's article has a video interview with Kayla Baker of Northline Development. She gives more background into their thinking process for this project along with a tentative timeline for development. Kayla and I met a while back to discuss her plans and she isn't going to have these priced so high that they will be out of reach. I won't mention the pricing she had in mind but I'm certain they will be obtainable by more people than one would think. I'm pretty sure they will go fast at pre-sale. I'm excited for her and SoSA both, as she has a great track record and awesome vision. At $250 a foot it would be in the $515K-585K area for 2058 to 2340 feet. Based on Pete's comment above maybe lower per sq footage price than that. 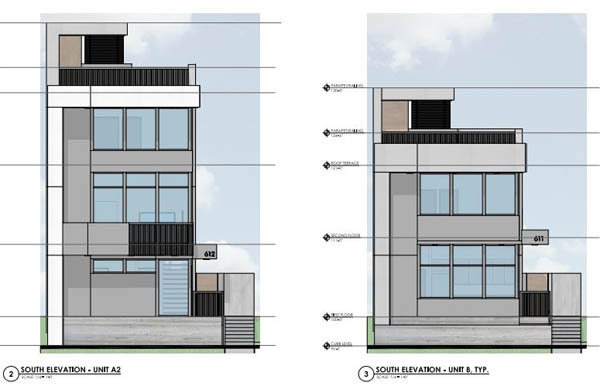 Ten percent reduction would pull it down into the $450k range on the smaller unit. Lisbon units were priced in the $270 foot range so this would actually be lower than those (different groups I know). 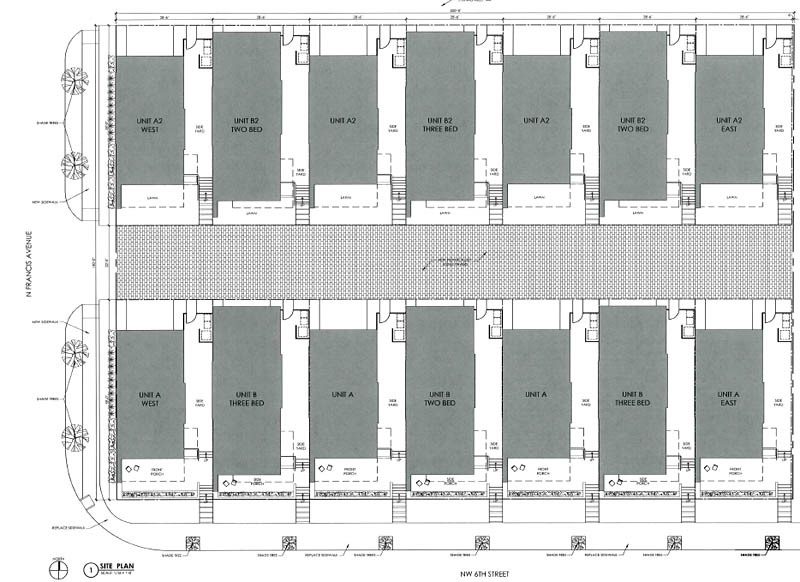 The units will be between 1,642 and 1,922 SF. I was going off of Steve's article in the paper today but that may have been update or revised. His numbers in the paper might have included some of the outdoor space too, not sure. Anybody know of any houses or townhomes?